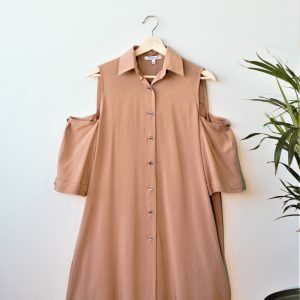 Button Up Cold Shoulder dress in sandy brown, featuring shirt collar, an asymmetric hem, and side seam pockets. *Due to monitor differences, actual colors may vary slightly from what appears online. 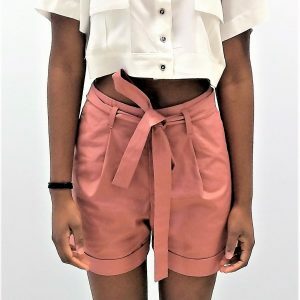 Heavy Cotton Light Salmon Pleated Shorts with side pockets and long belt. 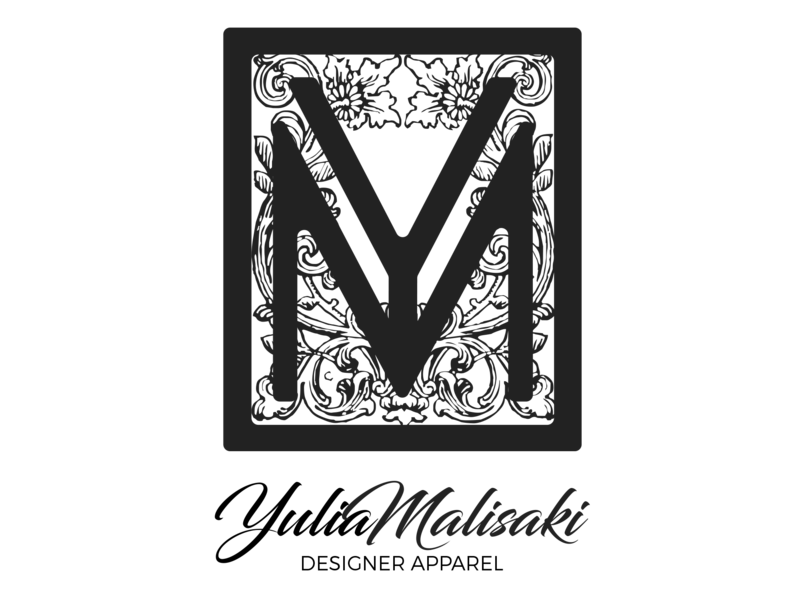 Fabric 98% Cotton 2%SP *Due to monitor differences, actual colors may vary slightly from what appears online. 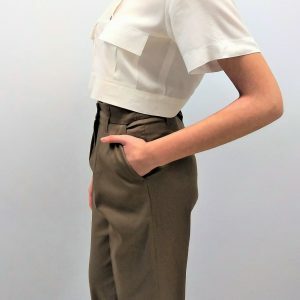 Heavy Cotton Pleated Trousers, featuring double-reverse pleats for a comfortable fit *Due to monitor differences, actual colors may vary slightly from what appears online. Silky Viscose Polymorphic Blouse, featuring high-low hemline, boat neckline, polymorphic design. *Due to monitor differences, actual colors may vary slightly from what appears online. 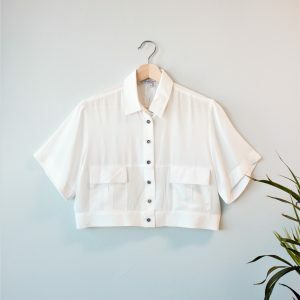 Silky Viscose Cropped Button Up Cargo Shirt, featuring cargo breast pockets and back cutouts. *Due to monitor differences, actual colors may vary slightly from what appears online. Cargo Zip Culotte in green-gray color made of silky twill fabric. Featuring inner stripe in contrasting fabric, cargo pockets on the sides, side pockets and long belt *Due to monitor differences, actual colors may vary slightly from what appears online. Silky Viscose High Low Blouse featuring puffed sleeves, asymmetric hemline and decorative lacing on the back. *Due to monitor differences, actual colors may vary slightly from what appears online. 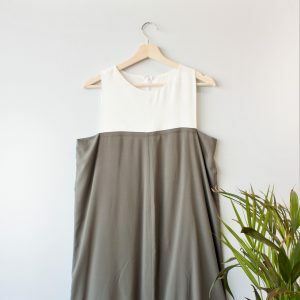 Silky Viscose Color Block Dress featuring boat neckline, decorative central seam, geometrical armhole, and back pockets in contrasting fabric. *Due to monitor differences, actual colors may vary slightly from what appears online. Silky Viscose Color Block Wrap Dress featuring v-neck, high split, and grosgrain ribbon fastening. 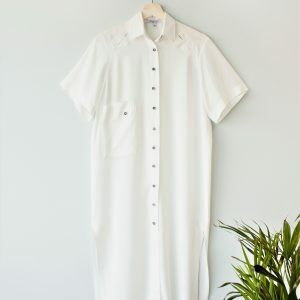 This easy dress is a perfect summer office look. Light and airy with a touch of femininity. *Due to monitor differences, actual colors may vary slightly from what appears online. 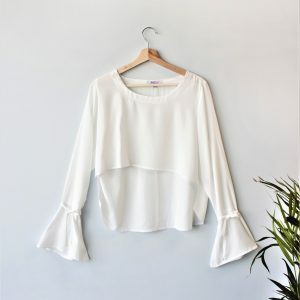 Silky Viscose Bell Sleeve blouse, featuring high-low hem, boat neckline with ribbons on the sleeves. 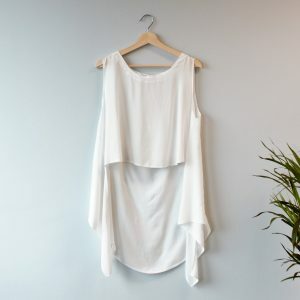 This white summer top is made of silky, breathable fabric and due to its loose fit is perfect for summer *Due to monitor differences, actual colors may vary slightly from what appears online. 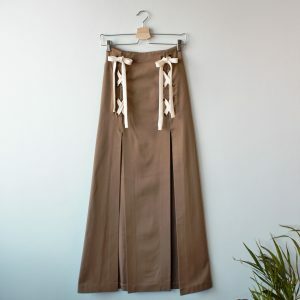 Wide Leg Palazzo Pants in soft twill, featuring front pleat, inner stripe in contrasting fabric and side pockets These summer trousers made of skin-friendly fabric have a wide fit, comfortable for summer and are a perfect office outfit *Due to monitor differences, actual colors may vary slightly from what appears online. 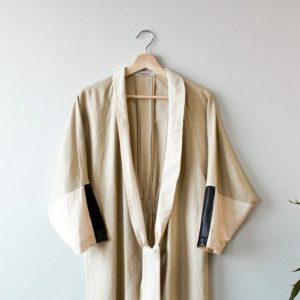 Long Kaftan Button Up Shirt in silky viscose, featuring decorative shoulder cut-outs double breast pocket and asymmetric hem This white summer cover-up in a silky-feel breathable fabric is a perfect summer outfit. *Due to monitor differences, actual colors may vary slightly from what appears online. 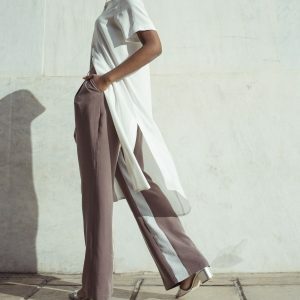 Wrap Over Trousers in lightweight stretchy crepe featuring inner stripe in contrasting fabric and side tie in grosgrain ribbon These asymmetric trousers made of light summer fabric and are cropped above the ankle. 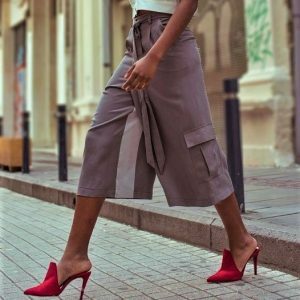 Inspired by Japanese minimalism these pleated trousers have a wrap-over closure. *Due to monitor differences, actual colors may vary slightly from what appears online. 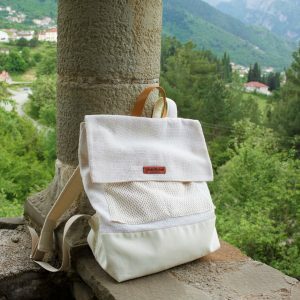 Minimal, off-white rucksack, made off sustainable materials such as cotton straw and canvas is handmade in Greece and ready to follow you on your summer adventures. Featuring two exterior pockets and leather handle. Fully lined with inner pocket. Off White Summer Beach Bag handmade in Greece. 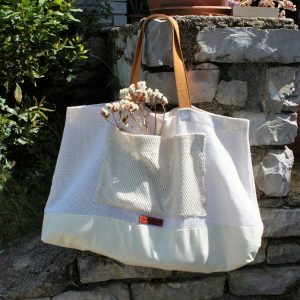 This beach tote is made of sustainable materials such as canvas and cotton straw, features leather handles and large exterior pocket.